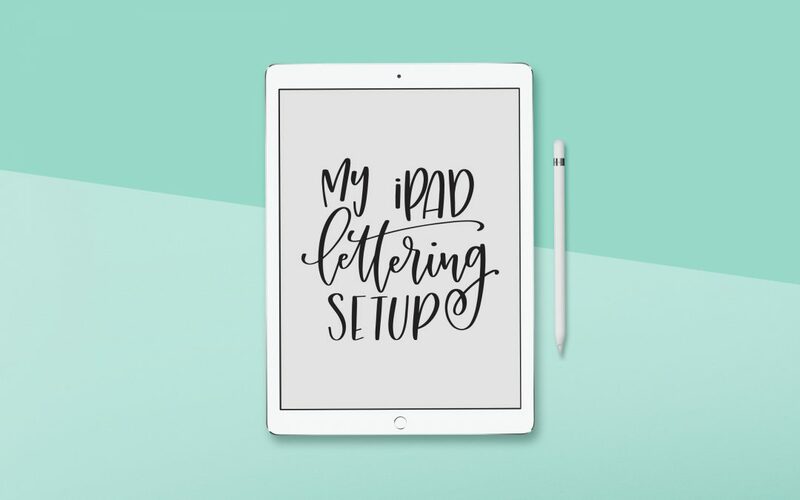 I’ve regularly get questions about my iPad lettering setup, so thought it made sense to compile all the info into one handy blog post. So here it is! This post was last updated January 2019. I love that using my iPad gives me the ability to letter in a huge range of styles and colours without having to carry 20 pens, 4 paintbrushes and 10 different coloured inks with me everywhere I go. Also, it has an undo function. Which is basically the best thing ever. On top of all of that (as if that wasn’t enough), it makes it it easy to re-write a single word 50 times when I’m trying to get it looking just right, or work quickly in a lot more detail when i’m doing sketchnotes at live events. I currently have a 256GB 9.7″ iPad Pr0, a 64GB 12.9″ iPad Pro (2nd Gen), and a 1TB 12.9″ iPad Pro (3rd Gen). I also have both the first and second generation Apple Pencils. I bought the 9.7″ in March 2016 thinking I would prefer the smaller size for portability over the larger screen size. It turns out I was wrong. I borrowed a friend’s 12.9″ for an event a in early 2017 and LOVED the larger screen. So in October 2017 I purchased a 12.9″ iPad Pro. I found it to be a little awkward at times to carry around with me, but the extra screen real estate is totally worth it. The upgrade to the 3rd Gen 12.9″ iPad Pro was fantastic – extra screen real estate, but a little more compact than the previous version. I also have the Apple Smart Keyboard cover on this device and find it super useful for doing non-lettery work when out and about. So, onto the apps and accessories I recommend investing in to get yourself setup for iPad lettering like a pro. So far I haven’t put a case on this Apple Pencil. I find it’s not slippery in the same way that the previous pencil was, the balance feels a little better, tho if my hands are too dry I struggle to grip it well. I’m concerned that a case would interfere with the magnetic charging, so haven’t looked into getting one for this pencil. The one I currently have on my 3rd Gen 12.9″ iPad Pro is just a cheap matte protector I purchased from eBay. I do all of my iPad lettering in the Procreate app. And my number one tip, particularly if you’re just starting out, is to make sure the streamline is at 90% or higher! It will help smooth out your lines and create lovely letter shapes. You can find Streamline under the Stroke tab in the brush settings (screenshot below). On top of that, getting great brushes makes a huge difference. You can find free brushes that are great for lettering, as well as buy them from online marketplaces and individual letters. My favourite brush is found inside Clarity, the leading online community for iPad Lettery people. 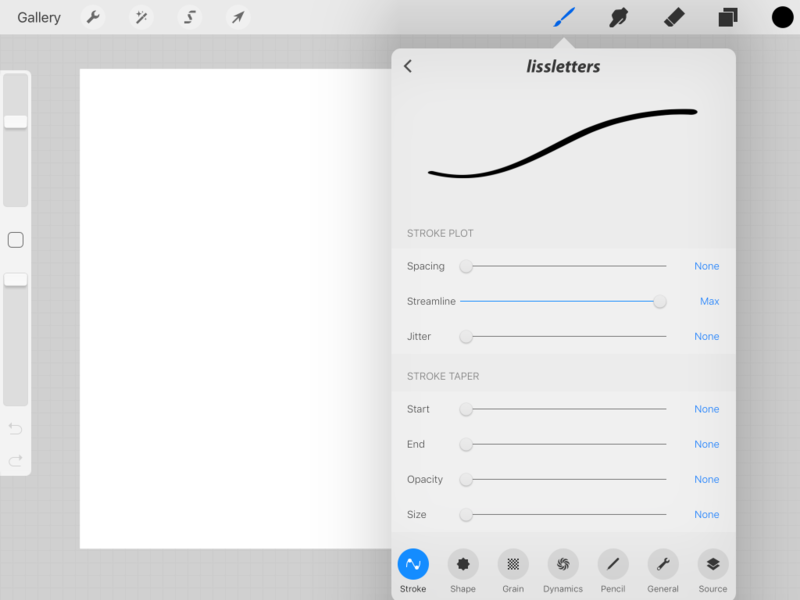 At the end of the day, you don’t need any of these specific things, but for just a few dollars on top of what you’ve already invested into your iPad Pro, I believe they will make a big difference to your lettering. If you already have an iPad Pro and want to dive into learning, jump into Clarity today!